Photography was not invented overnight - it developed comparatively slowly as people in several countries improved their different processes. The sensitivity of silver salts to light had been investigated, from a purely technical point of view, as early as the eighteenth century by Johann Schulze in Germany, Jean Senebier in Switzerland and William Lewis in England. Later, Thomas Wedgwood, son of the famous English potter Josiah Wedgwood, succeeded in producing short-lived impressions of plants and other objects which he placed directly onto leather or paper sensitized by silver nitrate. 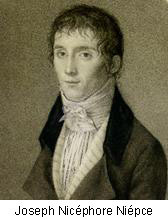 Nicéphore Niépce solved the problem of fixing an image on an "heliographic plate" in 1825, and in 1827 began working with Louis Jacques-Mandé Daguerre to improve a process that became known as "heliography". However, Niépce died in 1833 leaving his partner to continue the research alone. Daguerre was the Director of the Diorama (a popular Parisian light show), and was consequently familiar with the camera obscura. This instrument was essentially a dark box with a single small aperture to admit light. An image of a subject appropriately placed outside the box was then focused onto the inside surface opposite the aperture, and used as an aid to accurate drawing. Daguerre was fascinated by the clarity of the images this instrument produced, and wanted to fix them directly without the need for manual intervention. It was not until 1837 that he perfected a process that recorded camera obscura images in great detail. He used a copper plate sensitized with bitumen of Judea, and developed the image using mercury vapour. This became known as the "daguerreotype" process. However, Daguerre failed to market his idea and so sought official backing. His secrets were eventually handed over to the French State in return for an annual pension for life. 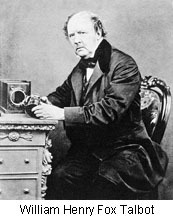 Almost immediately, in August 1839, the details of the daguerreotype process were revealed to the world and "photography", as it was first called by Sir John Herschel, was born. There followed an explosion of interest in this "magic" new invention. Demonstrations of "daguerreotyping" were given in the streets of Paris and use of the process soon spread throughout Europe and into the United States. Every enthusiast wanted to record local scenes, but the equipment required was cumbersome and prohibitively expensive. The success of the daguerreotype eclipsed every other rival process, but in 1840 William Henry Fox Talbot, an English scientist trained at Cambridge University, developed a "photogenic drawing" process that represented an important step forward. Starting with a negative image from a camera obscura, he developed a successful negative-to-positive process that made it possible to produce numerous positive prints of the same image. His invention, which became known as the "calotype", was protected by the granting of several patents in 1841. One of the principal problems of the daguerreotype was the exposure time. In 1838, according to Daguerre, exposure times of up to two hours could be required. These reduced rapidly as development gathered pace, and by 1840 exposures of only 10 seconds made portraiture possible. The first commercial portrait studios opened in the US in 1840 and in London and Paris a short time later. By 1853 there were more than one hundred daguerreotype studios in existence. Fox Talbot's calotype process was limited by the same requirement for long exposures, although he had reduced them to less than one minute by 1841. However, less rapid development ultimately led to the commercial failure of the calotype portrait, and consequently restricted use of the process to still-life and outdoor photography. It was particularly popular with travellers because its paper base made it lighter and more readily transportable than the heavy copper plates required for daguerreotypes. Calotypes also became well established in France, and several groups of enthusiasts produced notable collections of images. Some of their images were exhibited at the Great Exhibition in London in 1851, where a new technique based upon a glass negatives coated with collodion also gained recognition. The use of a smooth glass plate helped to produce a clear image with no grain. The combination of low exposure times, excellent clarity and the ability to make multiple prints, more or less guaranteed success for the collodion process. Indeed, from 1855 until the late 1870's it was used, in conjunction with an albumen-coated paper printing technique, as the principal photographic method. Photography had now grown into a new industry - a means of recording facts in an ever increasing range of human activities. Luxurious portrait studios flourished in cities and towns across Europe and the US, and people began accumulating albums filled with images of family and friends. Fortunes were made by the more successful exponents of the new art, but this in turn attracted the attention of many less knowledgeable amateurs. Photography had still to become a respected profession. From the mid 1850's governments and public institutions showed increasing interest in the potential of the new medium. Photographic records of monuments, architecture and various significant events were created, the police created identification records, and armed forced employed photographers to document the Crimean War (1853-6) and the American Civil War (1861-5). Exposure times were still too long to freeze action but images of battlefields and destroyed buildings brought home the horror of conflicts for the first time. Industry also began using photography for record keeping and promotional purposes. The railways, which were undergoing phenomenal expansion at the time, recorded their engineering achievements as well as the scenic beauty of the country through which their new tracks passed. By 1870, despite huge advances in technique, photography was still severely limited by practical problems. The many stages of the so-called wet collodion process required not only people with relevant knowledge but also numerous chemicals and cumbersome items of equipment. A typical outfit included a large and heavy camera supported by an equally massive tripod, glass plates, various chemicals, dishes and containers for sensitizing, developing and fixing, and of course a portable darkroom - usually something like a tent. A dry collodion process simplified procedures to some extent but lacked sensitivity and consequently required lengthy exposure times. Outdoor photography therefore remained inconvenient but travel photographers saw the potential of the medium and went to extraordinary, almost heroic, lengths to transport their equipment around the world. Of course their photographs lacked colour, because the various processes in use at the time produced images consisting only of shades of brown-and-white or blue-and-white. Anything approaching true colour could be achieved only by a laborious and somewhat unsatisfactory hand-colouring process. A significant reduction in exposure times came about in the early 1870's with the introduction of the silver gelatine print. This dry process, like many of its predecessors, initially suffered from insensitivity but was gradually developed to the point where effective instantaneity was achieved. Ease of use, short exposure times, the establishment of the silver bromide process, and the advent of photographs printed on paper launched a photography revolution. The number of books published on photography increased rapidly, and images began appearing in magazines and periodicals in the 1860's and 1870's. Problems associated with mechanical reproduction and the longevity of printed images plagued the publishing industry and the press for many years, but were gradually overcome. Photography had reached early maturity. The introduction by Kodak in 1889 of a snapshot camera loaded with a roll of flexible film, and later of the Kodak Brownie, finally placed a user-friendly photographic system into the hands of amateurs. In 1862, Louis Ducos du Hauron began development of a camera and photographic process designed to record full colour images. Six years later he suggested subtractive colour synthesis and patented a three-image process requiring the use of different filters and coloured papers. Charles Cox, a poet, also proposed his own separately developed additive process which superimposed orange, green and blue negatives to produce full colour. Neither of the methods proved practical nor found commercial success, but they nevertheless formed the basis of the Lumiére brothers' work at the beginning of the twentieth century. Auguste and Louis Lumiére were pioneers in the public projection of moving images. At their factory in Lyons in France they devised a varnished glass screen, coated on one side with tiny randomly-scattered particles of starch dyed in the three primary colours. A layer of panchromatic emulsion was applied to the reverse. Exposures were typically of a few seconds in good light and the plates were processed to give a positive colour image. This became known as the "autochrome" process, and was made available in 1907. In 1912 chromogenic development, the conversion of latent silver images directly to colour, was proposed. Kodachrome, the first commercial three-layer colour film based on this principle, became available in 1935.